Crispy Crunchy Fried Chicken – Chef Tom Cooks ! My version of this classic fried chicken recipe. Comes out so crunchy and crispy! 1. Place chicken in a bowl and cover with water. Cover the bowl with plastic wrap and let it sit in the refrigerator for 2-4 hours. 2. In another bowl, combine the flour and spices. Mix well. 3. Pour the buttermilk into another bowl. 4. Heat the shortening in a heavy skillet to about 300 degrees F.
5. Remove the chicken from the refrigerator and drain the water, pat the chicken dry. 6. First dip the chicken in the buttermilk, then into the flour mixture. Be sure to coat the chicken well with the flour mixture. Then dip the chicken back into the buttermilk and back into the flour for a second coating. 7. Fry the chicken 3-4 pieces at a time in the hot shortening. Cook for about 10-12 minutes on each side. 8. Place the chicken on a baking sheet and put it in a 200 degrees F oven while you cook the remaining chicken. Denise - March 18th, 2009 at 7:56 pm none Comment author #12891 on Crispy Crunchy Fried Chicken by Chef Tom Cooks ! This sounds great. I've been looking for a good fried chicken recipe – it's something I love, but can't typically eat at restaurants, because of food allergies to pepper. It's easy enough here to skip it. 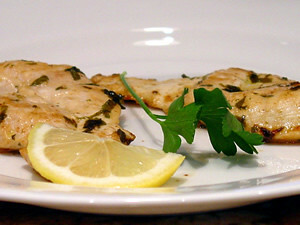 Can I fry the chicken in olive oil or should I use regular shortening? admin - March 19th, 2009 at 2:25 am none Comment author #12896 on Crispy Crunchy Fried Chicken by Chef Tom Cooks ! I would recommend using shortening, vegetable oil, or peanut oil. But you could definitely try olive oil. launceston computers - October 10th, 2009 at 12:24 am none Comment author #26724 on Crispy Crunchy Fried Chicken by Chef Tom Cooks !